No bodies | Climate Etc. §4.4.11 Global synthesis including impacts on biodiversity was quite specific. If warming reached 3°C above pre-industrial levels (projected absent serious mitigation) 21-52% of all species were committed to extinction (not necessarily yet extinct) by 2100. This official finding was based on 78 conclusions from 57 peer-reviewed papers on climate change impacts on biodiversity, all listed in WG2 table 4.1. It appears to be overwhelming scientific evidence. It isn’t. There are no bodies. In other words, there are no bodies. So how did IPCC AR4 WG2 reach its supposedly scientific conclusion? A bit of forensics starting with their figure 4.4 reveals the very dubious IPCC basis. The highlighted temperature rise of 1.6°C 9-31% global species loss is supported by findings 5-7; the 3°C 21-52% global species loss is supported by findings 46-52. Most other findings discuss areal changes in regional habitat, or single species impacts in specific ecosystems, for example the highlighted polar bears. These excerpts suggest IPCC intent to deceive in 4.4. The low temperature estimate depends on only one reference, #1, not three. The high temperature global estimate also depends on just #1, not the seven cited. The entire IPCC AR4 global extinction estimates come down to a single peer reviewed paper, #1 Thomas 2004. 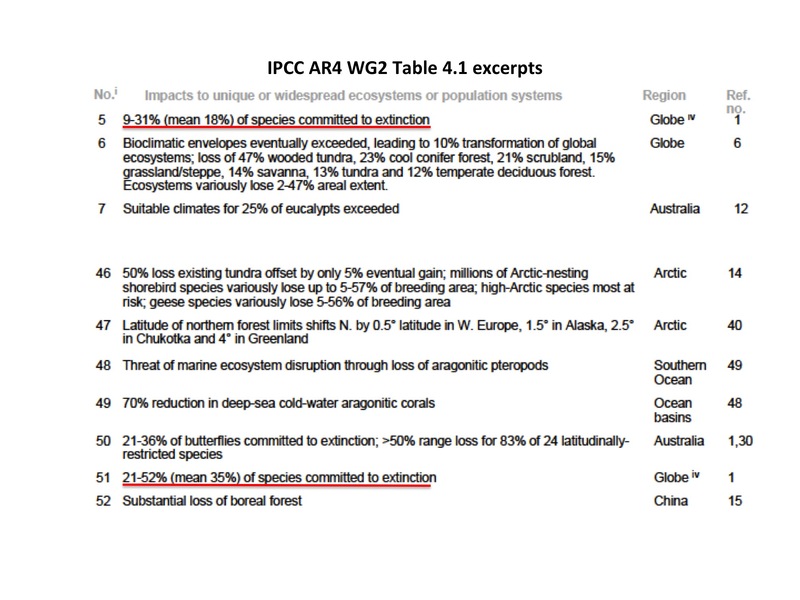 [vi] In fact, 13 of the listed 78 IPCC references are this single paper, including all numerical WG2 global extinction estimates except for freshwater fish. And fresh water fish weren’t globally risked in that sole other paper, as IPCC misrepresented. [vii] This singularity merits closer scrutiny. HadCM2 was used to model temperature and rainfall change in regional climate envelopes for 2050, and hence future regional envelope areas A. Modeled regional climate results are dubious because of well-known problems with regionally downscaled GCMs. [x] HadCM2 was also run “hot”. Supplemental information table 1 says a global mean anomaly of 2.6°C in 2050 for SRES A2, (with 2.1-3.9°C by modeled region). 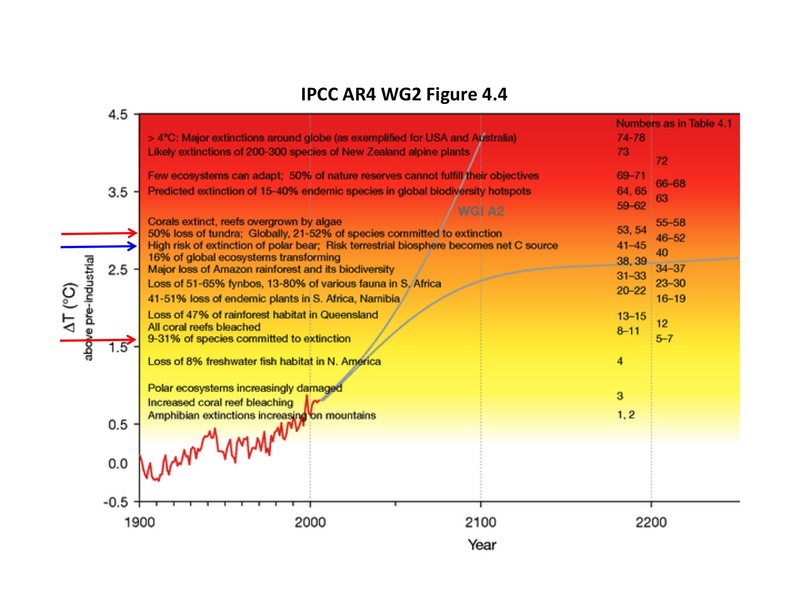 That is nearly twice what IPCC AR4 said (SPM Figure 5 scenario A2 ≈1.6°C), or Figure 4.4 as graphed (1.5°C-1.7°C). Using a dubious Z in a faulty equation with a hot climate input, this paper assessed 20% of Earth’s terrestrial surface in 7 specific regions, using seven groups of regionally endemic species including 112 mammals, 238 birds, 69 butterflies, and 607 plants. The SI does not identity the 1103 species assessed. Those endemic results were extrapolated without modification to the world, a ‘hidden’ selection bias significantly overstating general CAGW extinction risk. Despite the missing SI species information, some things can be inferred about the paper’s endemic species selection using the largest animal group, birds (since they are passionately well studied by ‘birders’, and the basis for ‘Z’). ‘Small’ Endemic Bird Areas (EBAs) account for about 2500 of the known 10518 avian species. EBAs are intensely monitored by birders since half of all EBA bird species are already classified as threatened by IUCN. Table 1 says endemic birds were assessed in four regions: Queensland Australia, South Africa, Europe, and Mexico. Queensland has 630 bird species of which 20-22 are endemic; table 1 says 13 were used in the study. South Africa has 843 species of which 19 are endemic; 5 were used. Europe has about 800 species of which only about 10 are endemic; 34 were used. Mexico has 1054 species, 145 EBA’s, and 98 endemic species; 186 were used. The paper selected 238 out of the 3019 bird species known in the studied regions, 8%. The selection is explicitly weighted (149/238) 63% endemic birds—half already listed as threatened for habitat reasons. That evidences selection bias. It is not subtle, merely somewhat hidden. Queensland can be scrutinized even more closely. All 20-22 endemic species (sources disagree as to exactly how many are just in Queensland) have limited ranges and specialized habitats just like the lemuroid ringtail possum. For example, Victoria’s Riflebird (the Duwuduwu) is a bird of paradise found only in Atherton Tableland (Plateau) remnant rainforests. 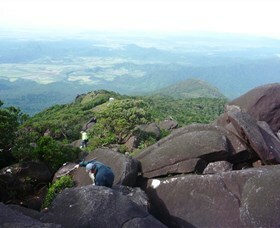 Half (11) of Queensland’s endemic birds live only in those high cool rainforest remnants, viewed from the Mt. Bartle Frere trailhead above Atherton Tableland. Just like lemuroid ringtails. Select only range limited endemic birds already surviving only in remnant ecosystem rainforests, regionally downsize HadCM2 to model overheating and reduced rainfall in them, and voila! Avian climate change extinction risk increases—a lot. Queensland birds were the highest risked of all animal species/regions in the paper’s Table 1 assessments. Even if true, this finding would not extrapolate to the other 610 Australian birds inhabiting a broader range and larger climate envelope than remnant Queensland high, cool rainforests. The paper’s bird result is methodologically overstated even for EBA species. It does not apply at all to the other three fourths of bird species with larger climate envelopes. Yet it was. Then that overstatement was compounded into the high end IPCC AR4 WG2 estimated extinction risk for all animal species. As two further examples of selection bias from Thomas et. al. plants, the World Wildlife Federation estimates there are 80,000 plant species in the Amazon region (nobody really knows). Thomas et. al. selected 9 (but did not say which 0.01%), and modeled a 69-87% extinction risk for those. Those estimates became part of the simple plant averages for all 4 regions. Thomas et. al. selected 243 out of roughly 400 species of South African Proteaceae (afrikanns ‘suikerbossie’ or sugarbushes, of which there are 80 generi and roughly 1600 species worldwide including the familiar macadamia nut). South African Proteaceae grow mainly in a specialized Cape Hope ecosystem known as the Fynbos, which covers just 6.7% of South Africa. The Queensland EBA ‘trick’ was also applied to plants. IPCC AR4 WG2 relied on nothing but one multiply flawed paper for its oft-repeated extinction estimates. [xi] That is a gross error equivalent to the AR4 Himalayan glaciers fiasco. Except better hidden, so undiscovered until now. The assertion remains, but now without falsifiable quantification. At least the actual causes of species extinction risk are now also noted as ‘interactions’. The correct number of CAGW mediated amphibian extinctions is exactly zero. The USGS [xiii], Amphibiaweb [xiv], and all recent scientific literature [xv] say the global amphibian decline since about 1980 is driven by the spread of chtryidiomycosis infection, which also did in the famous golden toad. [xvi] It is, to borrow from the present vernacular, EBOLA for amphibians. And despite this low agreement, the SPM still asserted high confidence—once habitat loss, over-exploitation, pollution, and invasive species were added in. -Observed global extinctions over the past few centuries have been caused by habitat loss, overexploitation, pollution, and invasive species. -Climate change has been identified as one of the extinction drivers only in amphibians, most notably the Golden Toad of Monteverde. This raised important issues about attribution: (1) an extremely virulent invasive fungal infection and (2) changes in regional climate related to natural variation. -The paleontological record indicating low extinction rates over the past few hundred thousand years of substantial natural fluctuations in climate raises concerns that modeled forecasts of high extinction rates due entirely to climate change may be overestimated. – There is growing consensus that it is the interaction of climate change with existing global pressures that poses the greatest threat to species. – There is low agreement on the overall number of species, taxa, regions, and time frames that might be at risk mainly from climate change, and a high degree of uncertainty from phenotype plasticity, fine scale climatic variation, and confounding existing extinction causes that continue to grow. Yet the AR5 WG2 SPM persisted in pronouncing large climate extinction risk. Chapter 4 did not correct the AR4 overestimate that CAGW commits 21-52% of all species to extinction by 2100 despite multiple subsequent peer-reviewed criticisms of the deeply flawed single paper on which it was ultimately based. Doing so would have exposed the biased AR4 process for what it was. A very poor semi-disguised selection biased meta-analysis on top of a single grossly but ‘hidden’ selection biased paper itself using repudiated methods. [xi] For example, at the Nature Conservancy and EPA websites. [xiv] amphibiaweb.org, maintained by the University of California Berkeley. [xvii] Lead authors are former Chief Scientist for the Environmental Defense Fund Michael Oppenheimer and Tyndall Centre’s climate impact simulation modeling head Rachel Warren. JC note: This is a guest post, please keep your comments relevant and civil. For reference, Rud’s previous CE posts can be found [here]. See Wills Eschenbach’s great “Show me the corpses” (or similar) article on WUWT a year or so back. Yet I’m guessing the climate exinction meme will be practically impossible to extinguish. Its emotive fire is just too hot to put out. A warmer world sustains more total life and more diversity of life. Exactly. The AGW debate was won a long time ago but the unholy alliance of politicians and scientists-for-hire extends throughout the post-normal structure of government science. The fundamental Judeo-Christian myth of expulsion from The Garden is too deeply embedded in our ethos for Westerners to accept that in any numbers. I agree with you. There were something like 38 species of great apes before the ice ages began, when the climate was so warm. Kim — your above comment raises my problem with Mr. Istvan’s blog post. Lets assume everything Mr. Istvan says is correct. Does this “prove” your statement? This smacks at the classic definition of anti-science. You can poke a gazillion holes in “Theory X”, but doing so doesn’t prove “Theory Y”. In the “big picture” of things, would an increase of 4 degrees have a very harmful impact on eco-systems (which could include species extinction)? Mr. Istvan’s blog post doesn’t give a science answer to this, nor does it prove your “Theory Y” (and the opinions of many CE bloggers that nature will just adapt). A much more constructive way to address IPCC views such a this (as with other IPCC catastrophic views such as on agriculture) is to not stray from the heart of the debate — the predictive ability of climate models. Can a lot of bad things happen if the Climate Models are correct? Of course, bad things “can” happen. But given the current state of climate models, their predictive ability is highly questionable. If Mr. Istvan’s intent was to show “See, the IPCC can not be trusted on this [species extinction], so why should they be trusted on anything?” — then he accomplished his mission. To me, Mr. Istvan’s blog post was a Red Herring to stir the pot and a diversion from the really important stuff (predictably of climate models, especially regional models). Why are the issues with the climate models more important that extinction / biodiversity issues? Kim’s comment Is accurate though not detailed; it is not part of a scientific paper and need not be detailed. In comparison, there are many people on this blog that are true believers of CAGW, making statements that are detailed and outrageously unscientific. The people are unaware of, or are ignoring these words from a first semester textbook on climate science: “So the background may be ordinary physics…but the study of the whole process (the climate process) has its own inique flavor. This approach (the scientific approach to climate science) is holistic rather than reductionist, because there is never a single cause. Stephen, the key is in Kim´s statement´s simplicity. A warmer climate does tend to support more species. If you doubt it, check the Amazon jungle versus say Russia´s tundra in the Nenets Okrug. If you wish to debate the point maybe you could focus on how all those Amazon jungle species will move South to Buenos Aires province in Argentina as the jungle spreads South. I guess the key hinges on how fast climate changes, right? What´s the best number for the transient climate response to 800 ppm CO2? Fernando — Respectfully, I disagree with you. The “CONTEXT” of the IPCC discussion is an increase of 4 degrees over current temperatures. Applying some “ubiquitous simplistic” statement (like Kim’s) to the IPCC views is out of “context”. For example, as I understand it, temps have increased about 4 degrees from the last Ice Age. Using Kim’s statement, one can say “See, nothing bad happened with a 4 degree change”. “total” is almost certain, “more diverse” probably requires more confirmation and you wonder if simply counting different species is always going to be the most wise policy. Would you want to lose a whale species to save 4000 different kinds of plankton that are pretty similar? That’s a rhetorical example not based on any active research before the usual suspects go into a tizzie. The MO of AGW belief systems from inception always includes bold certain statements that there is absolutely no quantifiable science to support. “Deep ocean heat”….assumed to support their theory, no evidence. “Solar neutral”….unknown. “Volcanic neutral”…unknown. “Carbon sink a fixed force”…..unknown. Each wrinkle, a new unknown is added to support the prior total accumulated belief system. If the public buys it once, why not add ten more piles of swill to the narrative? Their going as far as the lab coats and funding are going to permit as long as possible. Which get to the point of why are we spending so much energy on the obvious truth of the writer’s observation or your own Kim and so little effort on the motivations of those carving another fictitious narrative with gray science to back AGW gray claims? Politically, linking to traditional tree-hiphuggers makes good sense. The bird lovers have had to swallow their ego to rationalize the mass slaughter of rare birds due to the pathetic and crony wind industry in the great carbon war. The shame and hypocrisy of the Audubon Society, giving them the meme that fighting for “diversity” is at least a fig leaf of cover. Of course it’s junk science but isn’t that how it has always started and supported? If you start with a belief and then try to prove it philosophically what could go wrong? This of course isn’t the only reason for the diversity narrative. It is not the temperature per se that causes extinction, it is the rate of change, and this is about the fastest since the asteroid. It is not temperature per se that causes extinction, it is the rate of change, and this is about the fastest since the asteroid, and although what I said is 100 % true, there are no bodies. Exactly, it is the magnitude that matters too, and we can control that. Because evolution has taken place over millions and some billions of years, species have encountered all manner of climatic variance. It is in our ( life form’s ) DNA to tolerate these variances. Those species that could not tolerate climate variation were selected out of the gene pool long ago. The relatively small temperature variation of CO2 doubling does not appear to be the stuff of extinction. Sort of. The key to long term survival is to have a broad range of locals, not to over specialize and to have motility. I’ve long been amused that development of motility, and the ability to maintain the internal milieu through the clotting mechanism, are still somewhat puzzling to the Evolutionists, who depend upon faith to account for their development. These are so key, that I think time was long enough for their development, despite the doubts of the ID believers. Every day, we encounter temperature swings of ten’s of degrees and we don’t drop dead because of it. Annually, we may encounter temperature swings of over 100 degrees. And yet, here we are, wringing our hands over a few tenth’s of a degree change over many years. Something just doesn’t seem right. Interesting post, especially as the extinction issue was perhaps the only one doomsday issues that I payed attention to as a possible real bummer (once a species is gone, its gone forever). True enough, however on a philosophical note, evolution kind of implies extinctions, no? Species are what they are today, because other species were not just less successful, they actually failed ( extinction ). True. Its more of a selfish thing I think. Lots of little wonderful critters! Kind of a boring empty world if we nuke them all off. And of course they might be useful. According to researchers at Oxford, their report published in Nature, Neanderthal’s co-existed with humans in Europe for over 5000 years before becoming extinct. At the end they were living in small packets. Prior to this research there was speculation that the extinction was due to humans taking all the resources. Does this hypothesis still make sense? Climate change that is a major driver of speciation. The vast majority of extinct birds and animals during the last 200 years are on island and due to hunting and introduction of cats and rats. It was only recently I heard a report saying approximately 2 billion birds are killed each year by cats. Another 1/2 billion are killed flying into buildings. I’ve posted that here a couple of times whenever the idiotic start talking dead bodies under wind turbines. One of them actually pointed out that house cats aren’t likely to kill eagles. Don’t Dare Think is what I say. Cats are certainly a problem – e.g. http://www.australiangeographic.com.au/topics/wildlife/2013/03/natural-born-killers-the-problem-with-cats – but absolving wind turbines on this basis is more than shortsighted. It is perverse. Scale up wind turbine numbers by a hundred? It is an additional pressure will cause collapse in vulnerable populations. Cats and wind turbines got nothin on massive mirror-array power stations. Add to that the birds killed by wind turbines. The extinctions of animals due to climate change is not unlike the many other “potential” harms that may result from human released CO2. The rate of sea level rise has not increased either and that was supposed to be the largest single threat of a warmer world. Well, not to mention the habitat loss from massive solar farms (the California tortoise) and forest loss due to Europe’s growing fetish with burning wood to produce energy. AGW activists are killing off species faster than fossil fuel industries. Part of the clueless get away of green taglines is that we’ve reached “Soylent Green” levels of basic ignorance about nature. Much of the green movement is supported by urban dwellers who routinely demonstrate and accept completely ignorant talking points because they have no exposure at all. House cats are food group to the nature where I live. Only the toughest most belligerent and clever Toms are going to last very long as “outside” cats. If many of the bird species being slaughtered by idiot windmills could speak; “Bring us more house cats, take down the windmills”. It could never be much of problem here since winter mortality would have to be close to 100% for stray cats long before a blue heron could devour them in two bites. Even small dogs aren’t safe. House cats kill sparrow’s and small birds, it’s all mutually exclusive what damages to large seabirds in particular are happening and are going to happen in the near future. But to those in sitting in an apartment in a city worrying about “climate change” and a compliant media that doesn’t ask even basic questions the one liner about cats is readily accepted. Still it’s another wonderful example of the mendacious, willfully ignorant green talking point culture. House cats are villains, windmills and solar death traps are a noble cause. my personal opinion is that anyone who self identifies as being Green also self identifies as being a moron. That said, most of what you write above is pure crap. The part about cats being prey where you live may be true. I don’t know where that is, so I will accept it at face value. I will also accept Robert Ellisons number referenced on estimated bird kills from wind turbines. Arithmetic tells us that is a pittance compared to mortality numbers from cats and collisions with buildings. That’s not a Green thing, it is simply a fact. Yes, it is hypocritical of people to ignore bird kills from turbine blades when they call for decarbonization on the basis on global warming equating to the killing of species. Fair game to go after such fact challenged retards. Just don’t make the mistake of being a fact challenged yard in the other direction. BTW – if you think eagles and hawks are relatively rare, come to the Pacific NW. If Ospreys had a civic association I’d have an award for developing high rise luxury homes for them. I have nests all over the place on sites I have built. So what’s a Whooping Crain worth timg56? The fanatics would shut the oil industry down if given the usual calculus so my point about house cats is 100% correct unless you think sparrow has the same green value as Crain, Eagle or Loon or many other wetland wonders specially targeted by the wind industry. Housecats is another factoid targeted toward Hoi Polloi that only requires you can’t acknowledge there is a difference between a grape and a lemon. You can get that difference right timg56? Rud, thanks for a clear report on your investigation of the IPCC’s incorrect claims. Well researched and interesting. The problem is the use of the “species-area” relationship to predict extinctions, which you’ve described well. The underlying problem is, it doesn’t work … or if it does, the exponent “z” is so tiny that the effect is un-noticeable. It turns out that extinctions are a very poor metric for loss of biodiversity, because plants and animals never heard of the dang species-area relationship, and life is tenacious. Regards, and thanks again for a good post. Thanks to both of you — and congrats on the publication, Willis! Somebody had a theory and turned it into an equation. With math and everything! And they put it in a computer. Obviously, the results must be treated as revealed truth. Because science. What could go wrong? Besides, anyone who questions this truth is obviously anti-science. Very solid post. I think that the legal standard of falsus in unum falsus in omnibus should be applied to all of the SPMs. such a pile of assumptions…. Use of the species-area curve to estimate extinctions is entirely bogus. Not just in the context of global warming, but generally. 1) it tells you the number of species (of a given group) expected in a given area. It does not say they are unique to that area. 2) it has been experimentally tested only for small areas (e.g. smallish islands). Extrapolation to continental or larger areas is entirely unwarranted, and amounts to an abuse of mathematics. Claims that there is a mass extinction currently underway, with thousands of species going extinct annually, are based entirely on the species-area curve. No one can name these species. In fact there are only about a thousand *documented* extinctions (animal, plants, everything) in the whole of human history. (You doubt that? find me a longer list of named species). A human-caused mass extinction is one of the big lies of the “environmental” movement, and pre-dates CAGW. I liken the species area rule to the absurd idea that if you’d noticed that for every three Irish pubs you visited, you met someone with a last name you hadn’t encountered before (McCabe, O’Heaney, MacQuaid), and then reasoned that for every three Irish pubs that burn down, one entire Irish family lineage must go extinct. I’d also assert that we’re at the cusp of an explosion in species due to all the plants and animals we introduce into cities, many of which will act ecologically as island habitats. Weeping willows in Phoenix Arizona (a popular status symbol) obviously aren’t going to be cross-breeding with any other weeping willows, and the same applies to a great many “yard” species, both plants and animals. Willis argues that there have been only four, although I think he was only talking of animals. No doubt the IPCC report did not include the destruction of birds and bats by wind turbines and solar cells. Even if there are extinctions by 2100, try to disentangle all the other factors that may have contributed to those extinctions from the influence of AGW. Extinctions have occurred for millinea. This is not a new challenge. It is just another easy excuse for laying blame on increased levels of CO2. In terms of large fauna extinction, overpopulation is a greater danger. Already the the “bush meat” trade in Africa is creating serious inroads into wildlife populations. I thought that prior to ‘bush meat’, fish was the main source of protein in Africa, of course the fish were disappeared by using new methods to extract the vast resources for profit by the late sixties. The fishing fleets were abandoned after stocks were depleted and the fleet fell into disrepair. ‘Bush meat’ was forced to take up the slack. I have always quite liked island biogeography theory. It arises from a 1967 book by Edward Wilson and Robert MacArthur. It is based on observations of species richness inversely related to the size of available habitat. The Queensland lemuroid ringtail possum survives above 450m in rainforest between Cairns and Ingham. A very restricted habitat. One that is reduced by 200m for every degree C increase. It can’t survive at temperatures above 30 degrees C for more than 4 or 5 hours. The possum may be at threat but the presumption that other species in the same system have the same physiological limitations is a little stretched. Nonetheless the theory is sound – the losses are vastly more of obscure species that go unnoticed. The possum is merely emblematic. It adds to Holocene extinction pressures from a variety of causes – http://www.eoearth.org/view/article/150962/ – and should not be cavalierly dismissed. The criticism that should be raised is that the obsession with carbon dioxide diverts attention from responses on these many other pressures. Donna LaFramboise also wrote about this in her book about the IPCC. Meanwhile, native fauna, right outside my door, is torn to shreds round the clock, by feral dogs and cats – for lack of something which goes bang, and which also causes “grave concern” for our Green Betters. Remember Conservation? Whatever happened to that? Mosomoso, on my Wisconsin dairy farm, the ruffed grouse I used to love to hunt in the fall are gone. Two reasons, neither climate change. Anti-fur progressive sentiments meant that starting in the 1990’s raccoons were not worth trapping. They eat the eggs and young. And reintroduction of formerly extirpated wild turkeys (my new favorite fall hunting target) forage some of the same food resources. No competition between a 15 pound turkey and an 8 ounce grouse. I have a gentleman farmer neighbor who is a professor at U Wisconsin In Madison (with Berkeley, Cambridge, and Boulder the most progressive of leftist locals in the US). He must go un-named, since uses something that ‘bangs’ raccoons at every chance–his trusty .22 rifle. He is also a very disappointed former grouse enthusiast, a professor of ecology, and an ardent conservationist as you seem to be. I guess I see conservation as something which applies to money, coal, game, agricultural land etc as much as to native plants and wildlife – in an environment which was never stable or pristine. Here we can’t remove infuriating possums from our roofs or sensibly control the out of balance populations of disease carrying fruit bats or city-trashing ibis; meanwhile the death rate from introduced dogs and cats is massive and unremitting. I live in and around koala habitat. Ask me how long since I saw or even heard a koala. Even at the peak of heavy forestry, those guys were around. Not any more. Keep going bang, Rud. And good article! Rud, I’d say that mosomoso is an ardent common-sensist. Rud thanks for the additional perspective (not in my normal reading/should be). You have an impressive mix of interests. Many of your Wisconsin brethren come to New Mexico for the milder winter’s and other outdoor interests. We of course visit the Wisconsin golf which is incredible in beauty during early October.Thanks as always for taking time to educate. It’s just all guess work and so far most of the guesses have been wrong. You might as well just place every species name on earth on a piece of paper, place in a hat and pull out 100. These would probably have a greater chance of becoming extinct. Once again it’s just a case of “let’s scare the pants of children and gullible adults” and show the “worse case scenario”. And these fools want to run a world government. Lol. Rud Istvan, thank you for a good post. Prediction. 2100. For temp ranges we don’t yet have. I just LOVE precise predictions. Like this one. Can it ever be proven false? No, and neither does the IPCC WGII. Follow Rud at your peril. Well, that wouldn’t be good. The summaries should be an accurate reflection. Oh wait, so the WG2 TS is not “incorrect”. It’s spot on. Rud is ‘incorrect’. Yet again. Yes, it’s another Rud train wreck. But all is good at the ‘cutting edge e-salon’ of CE as long as the errors are in support of the prevailing anti-IPCC dogma. So….you say more than 50% of species will be extinct by 2100? Michael, I note your aspersions. And that you have not, since cannot, refute a single factual point made, or reference cited. Cause I double checked everything before sending this excerpt from my next book to Judith. One thing for sure, you would benefit from reading that book when it appears later this year, but probably won’t. You are definitely in the “My mind is made up, so don’t confuse me with facts” camp. Shouting train wreck does not mean there is a train wreck. You reveal much about yourself by doing so here. Please try to engage the substance, as others have. I engaged the biased meta analysis methods by which AR4 made a ‘scientific’ prediction, then backed its error in AR5 summaries despite a subtle climb down in the meat of AR5 WG2 chapter 4. Nowhere is a prediction of future temperature involved, other than what IPCC projected or what the faulty Thomas paper factually used. As to train wrecks, I would also suggest you ponder yours via the fact that the future has not yet arrived by definition. Avoid the millennial at your perennial, Michael. Yes. You did in fact say that. Don’t deny, explain. O f ing MG another book plug. The WUWT sheep love to be shorn until their skint. You can’t refute that ’cause I triple checked my double checked references citations documented on 27 8×10 color glossy pictures with circles and arrows and a paragraph on the back of each one explaining what each one was to be used as evidence. Consider two scenarios. One of a population of people that don’t care about species extinction and the other composed of people that care deeply. The first scenario occurred last in the USA back in the 1800’s where people cared little enough about the passenger pigeon that they sold the mass-hunted (using explosives!) birds as pet food. Fortunately for scores of species, the people that cared have been responsible for fewer extinction events than would have transpired with a purely Dominionist world-view hanging over the citizenry. I would suggest you get a grip. People that care realize how unstable native habitat can be and are willing to go to heroic measures to protect species from extinction. Well that’s just sad then. I’m happy to engage in more in-depth discussion if there is demonstrable good faith. Maybe you could quote me saying this? I think Rud very nicely makes the point that we had better be thinking about habitats. And perhaps focus on that more than predicted CO2 and ‘projected’ temperatures 100 years hence. I am glad to see you agree. So then why are the deniers so alarmist about bird and bat deaths due to wind turbines? At a proportion likely inverse to their concerns over species extinction in general ? Hypocrisy anyone? It’s always hypocrisy. Hypocrisy? It’s more akin to being concerned about real (and violent) deaths instead of extinctions that only exist in a badly flawed computer model. Would it be hypocrisy to feel alarm and concern at the slaughter of Yezedis in Iraq or the current outbreak of Ebola while ignoring the threat of human extinction from volcanic super-eruptions caused by the growing weight of the stockpiles of National Geographic magazines, which nobody ever seems to throw away? I got a mouldy one in which Herbert Hoover passes on a French tip that the best shortening for baking cake is chicken fat. George Turner, that is like fearing a volcanic eruption only after it has erupted, likewise hurricanes or tornadoes. It is about predictable outcomes, resilience, aversion of danger, or preparedness which seems to be a blind spot among skeptics who are just saying it can’t be bad because where are the catastrophes. That is a common theme. What’s interesting now is whether Rud will acknowledge this obvious error, or will merrily stick with it and publish it in his book. Then we’ll know if we are dealing with someone interested in a rational and honest discussion (ie real scepticism) or if it’s ideology and dogma, ie. climate-‘skepticism’. Build turbines; shoot feral cats; save millions of birds and bats. Sounds like a good time and a good cause. House cats are not supposed to be out there; they’re supposed to be on a leech, so that’s no problem. Save 100s of millions of birds and bats. My reading of your quote by Rud is that you have taken him completely out of context. While you are focused like a laser beam on one particular study that was correctly quoted, Rud is, as far as I can tell, correctly looking at the set of published work for which he is aware and concluding that the one particular study is likely wrong. This is the kind of work that the IPCC should have been doing rather than finding selective works to support their position, they should have been looking at the available set of papers and writing down what was the more likely thing. Disease was the factor in the extinctions, and the weight of the scientific knowledge to date shows this, so therefore the IPCC statement is wrong in that they did not take other information into account, but focused on one paper. The IPCC is saying that there is medium confidence that warming was the cause. I do not see your point, because although both can be technically correct, if one is a better description than the other, the better description should be used. It’s nothing about a study being quoted correctly or not. It’s the Technical Summary that Rud says is “incorrectly” reflecting a particular part of the WGII report and he gives an example, which he bolds. Yet, as I’ve shown with the quotes, the TS is absolutely consistent with WGII chapter. The TS is not incorrect, Rud is. No amount of ‘context’ can make that go away. Read it again, and I do not read it that way. My interpretation is not that they quoted in the summary the original report incorrectly, but that both the original report and the summary are taking one study and focusing on it, and disregarding contrary information. I really don’t care if the summary quotes the original correctly or not, I care what is closer to the truth, and it would seem to me that looking at all the evidence would be necessary for that and not to focus on one study that seems to agree with my preconceived notions. Rud expressly says that the problem is that the TS “incorrectly” summarizes the chapter. What ‘other way’ is there to read that?? What you are saying is that he is saying that the quote is not an accurate quote. It is an accurate quote as you have demonstrated. That is different than an accurate summary. An accurate summary is looking at all the evidence, not just one study. An important distinction in my mind. But it didn’t – it was completely accurate. A futher point is what studies are cited and what’s available, but that’s another matter…which I’ll get to. Not sure “Build more wind turbines” is good advice. We are the second largest operator of wind generation in the US. Three generating stations, with the latest coming on line about a year ago. Phase 1 of that station utilizes only 25% of the leased property. The remaining leases were sold off, as we have no plans in the 20 year forecast for further wind generation construction. There is a limit on how much generation can be devoted to wind. Even the most ardent supporters in that industry put the ceiling at 20% of current base load generation. That may be a bit optimistic. I am with you on the shooting cats part. The correct number of CAGW mediated amphibian extinctions is exactly zero. The USGS [xiii], Amphibiaweb [xiv], and all recent scientific literature [xv] say the global amphibian decline since about 1980 is driven by the spread of chtryidiomycosis infection, which also did in the famous golden toad. [xvi] It is, to borrow from the present vernacular, EBOLA for amphibians.” – rud. True to form, Rud is all over the place here. It’s a confused mess. The first cite is to Anchukaitisa and Evans (2010). Do they claim that the “golden toad was done in by the fungal disease “.? No. Is the “correct number” zero (let’s ignore the CAGW meme) ? – no. Is there debate – yes. Is there a ‘correct number’ no. That’s just rhetoric, backed by no reliable evidence. Does “all recent scientific literature” blame a fungus for frog extinctions? No. Most of it (cited in WGII, by the way), identifies a range of factors, land clearance, habitat loss, natural climate variability, fungal infections and AGW. Yes, another Rud train wreck. Could you give page number or complete quotation, please. Sorry, just catching up with this thread. Isn’t the gist of it that the technical summary incorrectly summarized, not that the TS was misquoted by the SPM? Yes, but Rud is saying the TS is incorect in relation to the relevant chapter, not to the SPM – it’s not. it’s spot on. The questio is wherer Rud will correct these multiple errors? Someone interested in a rational engagement would probably be quite grateful for the heads-up and the opportunity to improve the post. Right again, Michael. It’s posts like this one that makes CE impossible to distinguish from WUWT. The real tragedy is GCMs are “not even wrong” simulating regional climate. This makes all estimates of future habitat and species impact bogus and attempts at meaningful, results orientated responses impossible. We are currently left with a shotgun approach to risk-driven action. It’s all too bad that the RUd’s and Willis’s and Michael’s of the world can focus on beating up the other side. Distraction and mutual circle clucking seems to be their primary mission. Hopefully, the academic and commercial work on regional extreme weather impact predictions that insurance and big oil companies are so hungry for can be folded in to GCM efforts to identify the actual low hanging fruit of potential species and habitat impact that can guide actions that will have a positive effect in the real world. The real tragedy is GCMs are “not even wrong” simulating regional climate. This makes all estimates of future habitat and species impact bogus and attempts at meaningful, results orientated responses impossible. Isn’t that just what Rud said? Well – not to comment on the veracity of Howard’s views about GCMs, at least he’s being logically consistent, something that many “skeptics” seem to have a lot of difficulty with. Joshua: This is the root at your misunderstanding of the complex views some folks have about climate. The rampant push to consensus and broad action is unjustified. That does not mean do nothing. It means taking the no regrets path for now while objectively shredding apart the weaknesses and uncertainties in the current state of climate science. In risk assessment, we call this identifying data and/or knowledge gaps to update the conceptual site model. Based on these gaps, collect more data and conduct additional numerical evaluations in an iterative process. It’s part of the multiple working hypothesis approach that has been so successful in finding and extracting natural resources from the earth. Once the field of climate science escapes from the clutches of science activism and reaches the appropriate level of maturity, more focused and specific mitigation and adaptation programs can be developed. So-called skeptical amateurs like Mosher and McIntyre are working on filling in data and knowledge gaps and updating and/or verifying the conceptual model. This pisses off the entrenched bureaucratic academia that has over-sold climate disaster. Fortunately, the baby-boomer self righteous world saving do-gooders responsible for this sorry state are dying and retiring. The millennials are hitting their thirties and less susceptible to flower children magical motivated reasoning. Talk about magical thinking. There are no “no regrets” paths, and believing that this is a binary choice between a “regrets path” and a “no regrets” path is delusional. And of course, as to be expected, partisans on either side have diametrically opposed views of what is the “no regrets” path. The non-magical way of thinking is that there is no “no regrets” path that can be pre-selected for the quality of having no regrets. By definition, we can’t know what the “no regrets” path can be,. What we can do is discuss probablities, with an eye towards distinguishing between positions and interests. As long as people cling to positions, because their real intent is in waging identity-aggressive and identity-defensive battles – progress will not ensue. The zero sum game/scorched earth mentality employs, necessarily, magical thinking. Stakeholder dialog with an eye towards synergies and consequently, ownership over policy outcomes, is the way to go. We won’t get there unless people are more interested in good faith exchange than in vindicating a sense of victimhood. My guess is that can’t happen in this politicized context. Too many people are too identified with the issue. The issue will be settled only when enough time has passed for the long-term trends to become evident with no reasonable ambiguity. In the meantime, people will battle it out by over-interpreting short terms trends and a lack of long-term data. Such is the way that people deal with risk assessment in the face of uncertainty with polarized issues. The root of Josh’s misunderstanding is his junior high level of maturity and his inability to participate in honest discourse. Howard, why would big oil companies be specifically worried about regional extreme weather predictions? Is this caused by desires to improve design basis documents, or because they want to avoid potential liability? Joshua: I like you because of your many wonderful child-like qualities. However, when you get all adult conservative reactionary, I stop paying attention. IOW, I passed on reading silly retort. Filtering makes blogplay possible. timg56: see above. When he gets old and ossified he runs off the rails by mouth. > In risk assessment, we call this identifying data and/or knowledge gaps to update the conceptual site model. To what does this “this” refer, picking low hanging fruit while waiting for a gapless model like we never saw before? of the truth of AGW or things where the rationale does not include AGW. That is the regrets all all UNRELATED to the truth of AGW. of course one can play dumb and read “no regrets” literally. In other words, for steven “no regrets” means ignoring any risk posed by ACO2 to the atmosphere, and making decisions based on basically unrelated considerations..
That isn’t risk making in the face of uncertainty. That is risk making by ignoring uncertainty. And, of course, it means trading some potential regrets for other potential regrets because it is convenient to do so. Why? Because we’re absolutely certain that there will be benefits gained from doing so? That there are no potential “costs” associated with focusing on greater efficiency? And, of course, the “authority” has spoken. I like you because your arguments always display a quirky way of reasoning. In particular I like your posts where you reduce the climate wars to a cartoonish war between manly men like yourself and girly girls like those who disagree with you. I like those posts in particular because they are so mature and sophisticated in their analysis. Anyway, Howard, nice duck. And I always find it amusing to watch how you translate ducking into proof of your manly man virility. That isn’t decision-making in the face of uncertainty. That is decision-making by ignoring uncertainty. Mosh has it covered. If you understand his explanation of the No Regrets policy, it essentially negates the rationale for 99% of the deniers/skeptics commenting here. The joke is that there is no joke. There is no punchline. AGW theory is a hoax? Try harder. Decision making under uncertainty in real time is manly sport. It boils down to problem solving. Like flying an airplane in bad weather, like drilling a well in virgin terrain, like fixing a broken down car in a remote winter location with few tools, like raising your children to be thoughtful, strong and healthy, etc, etc, etc. You don’t ignore uncertainty, you prioritize uncertainty, make decisions, take action, assess the result, recalibrate, make decisions, take action, assess the results, and on and on and on. We manly men Always Keep Working the Problem. ==> “Decision making under uncertainty in real time is manly sport. It boils down to problem solving. Like flying an airplane in bad weather, like drilling a well in virgin terrain, like fixing a broken down car in a remote winter location with few tools, like raising your children to be thoughtful, strong and healthy, etc, etc, etc. I wonder whether a a girly girl agreeing with your manly manliness will force you to re-calibrate? No it does not mean ignoring the risk. No regrets is based in pragmatics. Doing what can be done. from the risk assessment of C02. The beauty is these actions ALSO address the C02 problem. we take the actions they demand, on the timetable they demand. you know those people who are in denial about the abject failure of their approach. They ignore the risk. no regrets addresses the risk, but not explicitly. The risk is reduced as a bonus.. as a GOOD unintended consequence. the practical solution in front of them. So – the policy makes no reference to AGW or any of the accompanying risks, and the rationale for policy development does not include AGW or any of the accompanying risks – but the risks accompanying AGW are not being ignored. So, Michael, you expect those species to all drop dead at exactly 1/1/2100? Interesting. We are only 20% of the way to the warming Rud was expecting. It may change from the situation now. That was AR4. The AR5 WG2 SPM is already out, and it doesn’t look like it gets any better for Rud from what they say. Probably more references in the intervening 7 years for him to look through since he is clearly highly concerned about this subject. Perhaps he will report back on expected extinction levels when that is published. Michael, WHT and all the others piling on Rud’s excellent work. First, Michael, I think you’ve misunderstood what Rud was saying in his excellent post. I don’t think he was pointing out a minor error between two IPCC releases. But what I find more flummoxing is this insistence by Left Wing Progressives that the most salient feature of any argument, of any issue is whether or not the participants ‘care.’ Were you not loved enough as children, was love so used to manipulate your behavior that you now elevate ‘caring’ to such high status as to make it the focal point of your worldview? It’s really bizarre that when arguing with a LWP, they eventually trot out this canard and use it as an accusation to beat their opponent around the head as though ‘not caring’ was obviously a great sin, a great crime, proof of the unworthiness, not just of the opponents argument (which it can’t possibly be) but of the opponent as well. Truly bizarre behavior. Do even you understand it? Funny listening to the guy in the cabbose commenting on the guy at the front of the train. If you survived the Optimum, the Minoan, the Roman the Medieval, you’ll probably handle this latest one, which is a pussycat so far. And if you’re highly vulnerable to global warming…you’re not here! I was thinking of “wet cucumber sandwich”…but didn’t want to offend you, Genghis. Good thing too, the wrath of Genghis might outweigh the peacefulness of Faustino. The Mongol hordes are poised in case non-warming-related extinction is required. A barrier of pointed bamboo sticks will prove no defence. Western civilization, namely American inventors (Maxim, Browning, Lewis, Gatling,etc) developed a very effective response. Ok, I should also give credit to a certain Scandinavian guy. Nitrocellulose was important. So to metallic cartridges. But that one is harder to credit to individuals. Over 6,000 new species have been discovered in the oceans relatively recently over the past several years… and, as many more await discovery in the near future! But they are not “new” species, just new to mankind. It is estimated that only 10% of species have been cataloged. Most are not included in most ocean carbon cycle experiments.For example bacteria are not included and yet they make up 90% of the ocean biomass. Light absorbing pigments such as proteorhodopsin (PR) are thought to be present in half of the bacterial species,and Dokdonia for example can harvest Co2 organically and inorganically a significant test for isotopic fractionation distributions. Sounds like the Left is worried about AGW leading to catastrophic extinctions of species they know nothing about. The biome, oceanic and terrestrial is likely to be an increasing carbon sink as the CO2 rises and/or if the Earth warms. Not right away. Perhaps in a few thousand, or hundred thousand, years, as new forms of climax ecosystem evolve. Is there a risk to keystone species such as the fig wasp? Maybe it is just me – I find it very difficult to make confident overgeneralizations but do like to consider all the angles. Rob – the life itself is a risky undertaking. And full of surprises, at that. For example, grasshopper can turn into locusts. I agree with you that we should consider all angles – but it should not be selectively picked angles only. A danger can always be found lurking in shadows. What happens if the 3 C change occurs over a one hundred year period? They don’t know. Obviously. This is interesting. The wasps can adapt to hybrid fig trees. I’m thinking that a 3 C change over 100 years probably wouldn’t be a huge evolutionary challenge to these guys. The fig-wasp mutualism originated between 70 and 90 million years ago as the product of a unique evolutionary event. Since then, cocladogenesis and coadaptation on a coarse scale between wasp genera and fig sections has been supported by both morphological and molecular studies. This illustrates the tendency towards coradiation of figs and wasps. Such strict cospeciation should result in identical phylogenetic trees for the two lineages  and recent work mapping fig sections onto molecular phylogenies of wasp genera and performing statistical comparisons has provided strong evidence for cospeciation at that scale. Groups of genetically well-defined pollinator wasp species coevolve in association with groups of genetically poorly defined figs. The constant hybridization of the figs promotes the constant evolution of new pollinator wasp species. Host switching and pollinator host sharing may contribute to the incredible diversity of figs. The wasps are morphologically adapted to specific species of figs. New fig hybrids don’t survive unless there is a subset of the population ready to step into the niche. The paper suggest that adaptation to increased temps may be possible – who am I to rule it out. Do you feel lucky? Er yes. The figs we eat, Ficus carica, are nothing like the wild variety and were first grown at least 10,000 years ago. They have been extensively selected by humans, evolving at an incredible speed, and yet the wasps have been able to keep up. Ficus carica is self fertile – so I suppose it makes getting lucky easier if you don’t need a partner or a wasp. Grasshoppers aside – the point is that what is under discussions is anthropogenic emissions which nominally are in theory amenable to mitigation. But denying that there is a risk of anthropogenic emissions seems entirely unwarranted. Oh, let’s not leave grasshoppers aside. Instead, let’s take our risk consideration a little out of the “extinction” box, and consider another type of risk: swarming (as Curious George mentioned above). AFAIK a full investigation of the evolutionary parameters of swarming behavior hasn’t been made, but we have no good reason to suppose that there aren’t a number of potential swarming species that haven’t been seen to exhibit that behavior in historical times. But, as we are constantly reminded by ignorant deniers, CO2 is plant food. And plants are locust food. Even without temperature changes, ecological changes resulting from increased pCO2 could well cause existing grasshopper populations to start exhibiting swarming behavior. Or even clades of insect far removed from grasshoppers. It’s not impossible, or even implausible, that some existing populations of insects continue to retain swarming (or other) behavior but have not used it since millions of years ago, when CO2 levels were much higher. Or before the major clades of C4 desert grasses evolved. Or both. There’s a vast number of potential risks like this, each presumably tiny individually but who knows the aggregate risk? Does this justify shutting down the Industrial Revolution to mitigate the risk? Only if you’re a socialists, and don’t like the Industrial Revolution anyway for other, ideological, reasons. Global ecosystems will adapt. They always do. Such adaptation might well involve large-scale transitions to ecologies with lower species diversity, lower over all carbon content, and lower genetic diversity among most of the species that make them up. That’s happened before, and will likely happen again. That lower carbon content, in turn, could well result in a lot more carbon being dumped into the atmosphere, which could in turn lead to a positive feedback reaction causing more catastrophic eco-reorganizations. But humans are probably the most adaptive species on the planet, at least for adaptation within the lifetime of individuals. How to adapt? The most important adaption, IMO, involves moving most of the critical agriculture into greenhouses. As the Industrial Revolution continues, the cost of building enclosed greenhouses (in factories) can be expected to decline relative to that of agriculture in open fields. Focusing R&D on wide-scale greenhouse agriculture would help to mitigate many risks to agriculture besides those from “climate change”, eco-system reorganization, and even suddenly emerging animal (e.g. insect) pests and the chemicals needed to fight them. There are many other approaches to adaptation, as well as mitigation/remediation of fossil CO2 dumping, that could be undertaken without putting the Industrial Revolution at (much) risk. But, IMO, enclosed agriculture certainly represents the “lowest-hanging fruit”. Speaking of grasshoppers, I recently saw something about a WaPo article talking about how we will need to eat them in order to feed 9 billion people. One more example on why some people should not be allowed to reproduce. With the side benefit of delaying the the time we reach 9 billion. This paper doesn’t actually say anything useful about what may happen to fig wasps if temperature gradually rises 3C over the next hundred years. It simply shows that if you take fig wasps used to an equitable climate with a consistent mean temperature and then cook them, the adult dispersal/pollinating stage, already short-lived, becomes even more short-lived (why?, possibly they burn up their energy reserves quicker, but that is not examined). The authors are pretty honest about their results in the Discussion, which is more than you can say for most studies that hype the inability of clades of organisms to adapt to temperature change (although this particular clade has persisted for at least 80 million years). Also, I wonder about the 3C prediction – I thought the tropics were expected to warm less than the temperate and arctic zones? I’m not sure what it would take to present a danger to, for example, the recently discovered yeti crab (so unusual it is to be the first of a new animal family): it’s already blind; and, it lives off the coast of Chile near deep-see hydrothermal vents that spew toxic chemicals. Thanks. You might like the forthcoming ( somewhen this year ) next book from which it was drawn. About ( not exactly sure) 10 other past CE guest posts are also drawn from it. Clean coal was the most recent. You post shows that not only is the IPCC science not settled, sometimes it isn’t even science. Species extinction: Just another group jumping on the global warming bandwagon. It has to be said on this thread. The post-pause theme song of the IPCC. But the IPCC is right, there have been thousands of extinctions. They’re just all in the deep ocean and involve undiscovered species. Either that or there is an island somewhere that has all the warm air, dead species, climate refugees, and missing hurricanes. You can buy that island if you want, but hurry before it sinks – it is, after all, the only place where sea level is rising rapidly. D*nial in its raw form. Everything was alive when the researchers arrived. Global surface temperature record; Very recent, flawed and adjusted. Global ocean temperature record: Very short term, earlier data far from global. Paleoclimate reconstructions: Flaws/coverage/inadeqaucy well discussed. Sea level rise Is it accelerating? Or is it a satellite problem? Ocean salinity: Sparse, huge internal/regional/time variations. Retreat of Arctic Ice: Is it unprecedented? Antarctic expansion? Glacier retreat: Back to where they were 1000, 2000, or 4000 years ago. Increased storms: Contradicted by data. Increased floods: Contradicted by data. Increased fires: Really? You want to use that as a metric? Species extinctions link: See Rud and Willis. So, is there still some other weak science out there that still needs to be examined? Conclusion: We had better focus on the important issues individually rather than just throwing it all into the CO2/carbon tax/ETS machine. Proposition The peculiar variety of skepticism that focuses exclusively upon the weakest science causes its practitioners to become more-and-more ignorant, yet (paradoxically) less-and-less aware of their ignorance. Remediation Biologist Ed Wilson’s works, including for example Ant Hill: a Novel, The Creation: An Appeal to Save Life on Earth, Letters to a Young Scientist, and Wilson’s autobiography Naturalist, all will go far to innoculate young Climate Etc readers against Rud Istvan’s dismal practice of non-learning, that is so directly causal of Dunning-Kruger syndrome. Jane Goodall’s Reason for Hope too is highly recommended! Climate change continues to drive energy policy, despite the fact that there is no way to reconcile the loss humanity’s God-given right to individual liberty, with the Western secular-socialist political agenda of eradicating carbon dioxide emissions around the world by government fiat. One big problem with the species-area curve approach is that it conflates evolution with persistence. Let us take the Eastern United States. It is a fully connected system for most species and they are thus found from Florida to southern Canada. With the exception of a subset of habitat specialists, species such as squirrels and oaks are prevented from generating new species because there are no barriers to interbreeding. This does NOT mean these species need everything from the Mississippi to the East Coast and Florida to Canada to persist. In the Southeast US at the peak of cotton farming most of the land was farmed (there is more forest there now than 80 yrs ago by far)–was there a mass extinction? Not that anyone can document. In the US Great Plains the case is even more extreme with the same result. The approach is simply nonsense on stilts. It’s a social “tell” that extreme greens are the ultimate privileged aristocrats tending their 19th century English gardens in their own mind that they demand a world of static non-change to the point of demanding the end of “extinction”. Man as god yet again. Of course most species that ever walked or crawled are already extinct and it had little to do with human existence. Progressives, the ultimate Luddite culture. That wants a twist of lime with their ice water. This is a response from a Sara Blake at the Open University on the blog. I (SB) got as far as establishing that the claim that ‘polar bears are thriving’ was based on a report of a meeting with a single scientist who said no such thing, and that the reference given for the extinction of the golden toad actually says ‘Rather, the extinction of the Monteverde golden toad (Bufo periglenes) appears to have coincided with an exceptionally dry interval caused by the 1986–1987 El Niño event’ (the two second’s Googling required to establish a likely link between El Nino and climate change is left as an exercise to the reader). The information on Adelie penguins does seem correct, but given that this Rud Istvan person is clearly happy to misrepresent his sources I don’t have any great confidence in the rest of the article. Nor any desire to waste more time checking it. R. Gresty: Ms. Blake didn’t read enough. The link regarding the polar bears involved two meetings with three notable scientists on both sides of the debate. There were also notable commentators providing expert information on polar bears; most striking is that observations of polar bears is difficult and recording an accurate number of bears from year to year is, at this time, not possible. Mr. Gresty, rather than second hand innuendo, please have your polar bear source Ms Blake contact me directly. I will put her in touch with a true polar bear expert, Dr. Susan Crockford at PolarBearScience.com. She has the cited Nunavit areal survey results. You might both learn something about represented sources. BTW, did you read the two 2014 papers on Adelie penguins, or just emot ‘happy to misrepresent his sources’ ? Typical ad hom, and factually wrong. Par for ‘your’ course, which is why ‘you’ are losing the debate. It isn’t about “climate communication skills”. That thesis presupposes you can fool all the people all the time. Mark Twain already pointed out that is not possible. I vote with Sam Clemens view, not your all. Anyone interested in polar bears who is not familiar when Dr Crockfords site is either incapable of independent thought or doesn’t really care about polar bears. And since we are on the subject of four legged animals, lets see in Michael can give a refutation to anything Susan Crockford has posted on her site. Coming from the ignorant woman who got it wrong…hardly, Michael. Rud has misrepresented the sources. And he’s got form – i’ve looked at several of his earlier posts, and these kind of ‘errors’ are common-place. Given that Rud is apparently planning to publish this stuff as a book, surely his fellow ‘skeptics’ should take the opportunity to help him out with some constructive scepticism and stop him making rather simple and obvious errors that might mar his book? speaking of misrepresenting sources, environmentalists got caught in yet another climate whopper. Seems more like you misread the article, Michael. Care to demontrate rather assert? I’ve demonstrated some clear and obvious inaccuracies by Rud. So I take it we are all bored with the obsession with carbon dioxide. But the fact remains that if you are not seeing extinctions caused by people one way or another then you are certainly not looking hard enough. Can we lose the African elephant? Either – or any of a thousand other species – would be heartbreaking. But the thing to note is that the solution to that problem is very likely to NOT be the instigation of carbon trading scheme, or a carbon tax, or compulsory use of renewables. In the case of the gorillas and the elephants, it may be that the introduction of cheap coal fired power stations (modern, efficient ones of course!) may reduce requirements to cut down trees for fuel, allow more time and lighting for reading and education (Google Hans Rosling and the magic washing machine TED talk) and create an economy and society where the need and the desire to murder gorillas and elephants for cash is greatly diminished. There are many solutions to the range of global problems including emissions – none of them taxes or caps. Seems a reasonable list, and probably mostly in order of priority, Rob. Clearly they see the point that there is more to it all than CO2. Re caps and taxes, I note it is a list of priorities, not solutions. Improvements in black carbon, tropospheric ozone, nitrous oxide and methane emissions emerge from agricultural and energy progress. Population pressures respond to health, development, education, safe water and sanitation progress. Carbon dioxide concentrations are mitigated by increasing soil organics and conserving and restoring ecosystems. Energy innovation leads to cheap and reliable low carbon energy. Modular nuclear is my pick. Especially for places with an undeveloped grid. I agree on all that.. Including modular nuclear. It would simplify a lot of things. Having read a number of intelligent comments upthread on a range of aspects of evolutionary theory and observation I think a few of you might be interested in reading at least a summary of a new book “40 Years of Evolution.” by the Grants, well-known evolutionary biologists. I was reminded of this from Mr. Turner’s cogent mentioning that weeping willows in Phoenix was an example of the circumstance likely to generate new species. Their research on finches was centered on a small island, Daphne Major, in the Galapagos Archipelago, made famous by Darwin, the giant whose shoulders they stand upon. Personally, I think while Climate Change, land use, and species utilization (tasting like chicken is a bad thing) might all be crucial in the evolutionary success of a species, it is the growing power of the invasive species’ dynamic that is most threatening in our rapidly shrinking (or is it flattening?) world. The present Ebola scare, where a traveler infected by an extremely rare and deadly virus acquired in the deepest Dark of Africa, can be sharing it with you in Any Town U.S.A., in less than 24 hours is but one face of this evolutionary New World we live in. To end on a positive note; for those that think diversity is headed for a world inhabited with only humans, cockroaches and ravens, I’d note that West Nile Virus has ravens dropping from the sky regularly here in Silicon Valley these days. It might be time to recycle your Raid and make friends with the future rulers of Earth. WWF Greenpeace et al have been telling anyone who would listen that pretty much everything is going extinct immediately for as long as I can remember.